Indian mathematics emerged in the Indian subcontinent from 1200 BC until the end of the 18th century. In the classical period of Indian mathematics (400 AD to 1200 AD), important contributions were made by scholars like Aryabhata, Brahmagupta, Bhaskara II, and Varāhamihira.The decimal number system in use today was first recorded in Indian mathematics. Indian mathematicians made early contributions to the study of the concept of zero as a number, negative numbers, arithmetic, and algebra. In addition, trigonometry was further advanced in India, and, in particular, the modern definitions of sine and cosine were developed there. These mathematical concepts were transmitted to the Middle East, China, and Europe and led to further developments that now form the foundations of many areas of mathematics. Ancient and medieval Indian mathematical works, all composed in Sanskrit, usually consisted of a section of sutras in which a set of rules or problems were stated with great economy in verse in order to aid memorization by a student. This was followed by a second section consisting of a prose commentary (sometimes multiple commentaries by different scholars) that explained the problem in more detail and provided justification for the solution. In the prose section, the form (and therefore its memorization) was not considered so important as the ideas involved. All mathematical works were orally transmitted until approximately 500 BCE; thereafter, they were transmitted both orally and in manuscript form. The oldest extant mathematical document produced on the Indian subcontinent is the birch bark Bakhshali Manuscript, discovered in 1881 in the village of Bakhshali, near Peshawar (modern day Pakistan) and is likely from the 7th century CE. A later landmark in Indian mathematics was the development of the series expansions for trigonometric functions (sine, cosine, and arc tangent) by mathematicians of the Kerala school in the 15th century CE. Their remarkable work, completed two centuries before the invention of calculus in Europe, provided what is now considered the first example of a power series (apart from geometric series). However, they did not formulate a systematic theory of differentiation and integration, nor is there any direct evidence of their results being transmitted outside Kerala. Excavations at Harappa, Mohenjo-daro and other sites of the Indus Valley Civilisation have uncovered evidence of the use of "practical mathematics". The people of the Indus Valley Civilization manufactured bricks whose dimensions were in the proportion 4:2:1, considered favourable for the stability of a brick structure. They used a standardised system of weights based on the ratios: 1/20, 1/10, 1/5, 1/2, 1, 2, 5, 10, 20, 50, 100, 200, and 500, with the unit weight equaling approximately 28 grams (and approximately equal to the English ounce or Greek uncia). They mass-produced weights in regular geometrical shapes, which included hexahedra, barrels, cones, and cylinders, thereby demonstrating knowledge of basic geometry. Hollow cylindrical objects made of shell and found at Lothal (2200 BCE) and Dholavira are demonstrated to have the ability to measure angles in a plane, as well as to determine the position of stars for navigation. Hail to śata ("hundred," 102), hail to sahasra ("thousand," 103), hail to ayuta ("ten thousand," 104), hail to niyuta ("hundred thousand," 105), hail to prayuta ("million," 106), hail to arbuda ("ten million," 107), hail to nyarbuda ("hundred million," 108), hail to samudra ("billion," 109, literally "ocean"), hail to madhya ("ten billion," 1010, literally "middle"), hail to anta ("hundred billion," 1011, lit., "end"), hail to parārdha ("one trillion," 1012 lit., "beyond parts"), hail to the dawn (uṣas), hail to the twilight (vyuṣṭi), hail to the one which is going to rise (udeṣyat), hail to the one which is rising (udyat), hail to the one which has just risen (udita), hail to svarga (the heaven), hail to martya (the world), hail to all. With three-fourths Puruṣa went up: one-fourth of him again was here. The Satapatha Brahmana (ca. 7th century BCE) contains rules for ritual geometric constructions that are similar to the Sulba Sutras. The Śulba Sūtras (literally, "Aphorisms of the Chords" in Vedic Sanskrit) (c. 700–400 BCE) list rules for the construction of sacrificial fire altars. Most mathematical problems considered in the Śulba Sūtras spring from "a single theological requirement," that of constructing fire altars which have different shapes but occupy the same area. The altars were required to be constructed of five layers of burnt brick, with the further condition that each layer consist of 200 bricks and that no two adjacent layers have congruent arrangements of bricks. According to (Hayashi 2005, p. 363), the Śulba Sūtras contain "the earliest extant verbal expression of the Pythagorean Theorem in the world, although it had already been known to the Old Babylonians." The diagonal rope (akṣṇayā-rajju) of an oblong (rectangle) produces both which the flank (pārśvamāni) and the horizontal (tiryaṇmānī) <ropes> produce separately." Since the statement is a sūtra, it is necessarily compressed and what the ropes produce is not elaborated on, but the context clearly implies the square areas constructed on their lengths, and would have been explained so by the teacher to the student. They contain lists of Pythagorean triples, which are particular cases of Diophantine equations. They also contain statements (that with hindsight we know to be approximate) about squaring the circle and "circling the square." which expresses √2 in the sexagesimal system, and which is also accurate up to 5 decimal places (after rounding). As the main objective of the Sulvasutras was to describe the constructions of altars and the geometric principles involved in them, the subject of Pythagorean triples, even if it had been well understood may still not have featured in the Sulvasutras. The occurrence of the triples in the Sulvasutras is comparable to mathematics that one may encounter in an introductory book on architecture or another similar applied area, and would not correspond directly to the overall knowledge on the topic at that time. Since, unfortunately, no other contemporaneous sources have been found it may never be possible to settle this issue satisfactorily. In all, three Sulba Sutras were composed. The remaining two, the Manava Sulba Sutra composed by Manava (fl. 750–650 BCE) and the Apastamba Sulba Sutra, composed by Apastamba (c. 600 BCE), contained results similar to the Baudhayana Sulba Sutra. An important landmark of the Vedic period was the work of Sanskrit grammarian, Pāṇini (c. 520–460 BCE). His grammar includes early use of Boolean logic, of the null operator, and of context free grammars, and includes a precursor of the Backus–Naur form (used in the description programming languages). Kātyāyana (c. 3rd century BCE) is notable for being the last of the Vedic mathematicians. He wrote the Katyayana Sulba Sutra, which presented much geometry, including the general Pythagorean theorem and a computation of the square root of 2 correct to five decimal places. Although Jainism as a religion and philosophy predates its most famous exponent, the great Mahavira (6th century BCE), most Jain texts on mathematical topics were composed after the 6th century BCE. Jain mathematicians are important historically as crucial links between the mathematics of the Vedic period and that of the "classical period." In addition to Surya Prajnapti, important Jain works on mathematics included the Sthananga Sutra (c. 300 BCE – 200 CE); the Anuyogadwara Sutra (c. 200 BCE – 100 CE); and the Satkhandagama (c. 2nd century CE). Important Jain mathematicians included Bhadrabahu (d. 298 BCE), the author of two astronomical works, the Bhadrabahavi-Samhita and a commentary on the Surya Prajinapti; Yativrisham Acharya (c. 176 BCE), who authored a mathematical text called Tiloyapannati; and Umasvati (c. 150 BCE), who, although better known for his influential writings on Jain philosophy and metaphysics, composed a mathematical work called Tattwarthadhigama-Sutra Bhashya. Mathematicians of ancient and early medieval India were almost all Sanskrit pandits (paṇḍita "learned man"), who were trained in Sanskrit language and literature, and possessed "a common stock of knowledge in grammar (vyākaraṇa), exegesis (mīmāṃsā) and logic (nyāya)." Memorisation of "what is heard" (śruti in Sanskrit) through recitation played a major role in the transmission of sacred texts in ancient India. Memorisation and recitation was also used to transmit philosophical and literary works, as well as treatises on ritual and grammar. Modern scholars of ancient India have noted the "truly remarkable achievements of the Indian pandits who have preserved enormously bulky texts orally for millennia." That these methods have been effective, is testified to by the preservation of the most ancient Indian religious text, the Ṛgveda (ca. 1500 BCE), as a single text, without any variant readings. Similar methods were used for memorising mathematical texts, whose transmission remained exclusively oral until the end of the Vedic period (ca. 500 BCE). The knowers of the sūtra know it as having few phonemes, being devoid of ambiguity, containing the essence, facing everything, being without pause and unobjectionable. Extreme brevity was achieved through multiple means, which included using ellipsis "beyond the tolerance of natural language," using technical names instead of longer descriptive names, abridging lists by only mentioning the first and last entries, and using markers and variables. The sūtras create the impression that communication through the text was "only a part of the whole instruction. The rest of the instruction must have been transmitted by the so-called Guru-shishya parampara, 'uninterrupted succession from teacher (guru) to the student (śisya),' and it was not open to the general public" and perhaps even kept secret. The brevity achieved in a sūtra is demonstrated in the following example from the Baudhāyana Śulba Sūtra (700 BCE). II.64. After dividing the quadri-lateral in seven, one divides the transverse [cord] in three. II.65. In another layer one places the [bricks] North-pointing. According to (Filliozat 2004, p. 144), the officiant constructing the altar has only a few tools and materials at his disposal: a cord (Sanskrit, rajju, f.), two pegs (Sanskrit, śanku, m.), and clay to make the bricks (Sanskrit, iṣṭakā, f.). Concision is achieved in the sūtra, by not explicitly mentioning what the adjective "transverse" qualifies; however, from the feminine form of the (Sanskrit) adjective used, it is easily inferred to qualify "cord." Similarly, in the second stanza, "bricks" are not explicitly mentioned, but inferred again by the feminine plural form of "North-pointing." 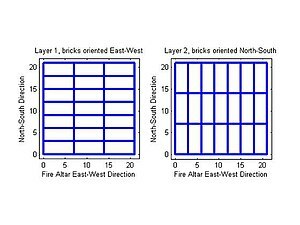 Finally, the first stanza, never explicitly says that the first layer of bricks are oriented in the East-West direction, but that too is implied by the explicit mention of "North-pointing" in the second stanza; for, if the orientation was meant to be the same in the two layers, it would either not be mentioned at all or be only mentioned in the first stanza. All these inferences are made by the officiant as he recalls the formula from his memory. With the increasing complexity of mathematics and other exact sciences, both writing and computation were required. Consequently, many mathematical works began to be written down in manuscripts that were then copied and re-copied from generation to generation. India today is estimated to have about thirty million manuscripts, the largest body of handwritten reading material anywhere in the world. The literate culture of Indian science goes back to at least the fifth century B.C. ... as is shown by the elements of Mesopotamian omen literature and astronomy that entered India at that time and (were) definitely not ... preserved orally. Example (uddeśaka) usually in verse. Setting (nyāsa/sthāpanā) of the numerical data. Working (karana) of the solution. Verification (pratyayakaraṇa, literally "to make conviction") of the answer. These became rare by the 13th century, derivations or proofs being favoured by then. Typically, for any mathematical topic, students in ancient India first memorised the sūtras, which, as explained earlier, were "deliberately inadequate" in explanatory details (in order to pithily convey the bare-bone mathematical rules). The students then worked through the topics of the prose commentary by writing (and drawing diagrams) on chalk- and dust-boards (i.e. boards covered with dust). The latter activity, a staple of mathematical work, was to later prompt mathematician-astronomer, Brahmagupta (fl. 7th century CE), to characterise astronomical computations as "dust work" (Sanskrit: dhulikarman). It is well known that the decimal place-value system in use today was first recorded in India, then transmitted to the Islamic world, and eventually to Europe. The Syrian bishop Severus Sebokht wrote in the mid-7th century CE about the "nine signs" of the Indians for expressing numbers. However, how, when, and where the first decimal place value system was invented is not so clear. The earliest extant script used in India was the Kharoṣṭhī script used in the Gandhara culture of the north-west. It is thought to be of Aramaic origin and it was in use from the 4th century BCE to the 4th century CE. Almost contemporaneously, another script, the Brāhmī script, appeared on much of the sub-continent, and would later become the foundation of many scripts of South Asia and South-east Asia. Both scripts had numeral symbols and numeral systems, which were initially not based on a place-value system. The earliest surviving evidence of decimal place value numerals in India and southeast Asia is from the middle of the first millennium CE. A copper plate from Gujarat, India mentions the date 595 CE, written in a decimal place value notation, although there is some doubt as to the authenticity of the plate. Decimal numerals recording the years 683 CE have also been found in stone inscriptions in Indonesia and Cambodia, where Indian cultural influence was substantial. There are older textual sources, although the extant manuscript copies of these texts are from much later dates. Probably the earliest such source is the work of the Buddhist philosopher Vasumitra dated likely to the 1st century CE. Discussing the counting pits of merchants, Vasumitra remarks, "When [the same] clay counting-piece is in the place of units, it is denoted as one, when in hundreds, one hundred." Although such references seem to imply that his readers had knowledge of a decimal place value representation, the "brevity of their allusions and the ambiguity of their dates, however, do not solidly establish the chronology of the development of this concept." A third decimal representation was employed in a verse composition technique, later labelled Bhuta-sankhya (literally, "object numbers") used by early Sanskrit authors of technical books. Since many early technical works were composed in verse, numbers were often represented by objects in the natural or religious world that correspondence to them; this allowed a many-to-one correspondence for each number and made verse composition easier. According to Plofker 2009, the number 4, for example, could be represented by the word "Veda" (since there were four of these religious texts), the number 32 by the word "teeth" (since a full set consists of 32), and the number 1 by "moon" (since there is only one moon). So, Veda/teeth/moon would correspond to the decimal numeral 1324, as the convention for numbers was to enumerate their digits from right to left. The earliest reference employing object numbers is a ca. 269 CE Sanskrit text, Yavanajātaka (literally "Greek horoscopy") of Sphujidhvaja, a versification of an earlier (ca. 150 CE) Indian prose adaptation of a lost work of Hellenistic astrology. Such use seems to make the case that by the mid-3rd century CE, the decimal place value system was familiar, at least to readers of astronomical and astrological texts in India. These counting boards, like the Indian counting pits, ..., had a decimal place value structure ... Indians may well have learned of these decimal place value "rod numerals" from Chinese Buddhist pilgrims or other travelers, or they may have developed the concept independently from their earlier non-place-value system; no documentary evidence survives to confirm either conclusion." The oldest extant mathematical manuscript in India is the Bakhshali Manuscript, a birch bark manuscript written in "Buddhist hybrid Sanskrit" in the Śāradā script, which was used in the northwestern region of the Indian subcontinent between the 8th and 12th centuries CE. The manuscript was discovered in 1881 by a farmer while digging in a stone enclosure in the village of Bakhshali, near Peshawar (then in British India and now in Pakistan). Of unknown authorship and now preserved in the Bodleian Library in Oxford University, the manuscript has been variously dated—sometimes as early as the "early centuries of the Christian era." The 7th century CE is now considered a plausible date. One merchant has seven asava horses, a second has nine haya horses, and a third has ten camels. They are equally well off in the value of their animals if each gives two animals, one to each of the others. Find the price of each animal and the total value for the animals possessed by each merchant. The prose commentary accompanying the example solves the problem by converting it to three (under-determined) equations in four unknowns and assuming that the prices are all integers. In 2017, three samples from the manuscript were shown by radiocarbon dating to come from three different centuries: from 224-383 AD, 680-779 AD, and 885-993 AD. It is not known how fragments from different centuries came to be packaged together. This period is often known as the golden age of Indian Mathematics. This period saw mathematicians such as Aryabhata, Varahamihira, Brahmagupta, Bhaskara I, Mahavira, Bhaskara II, Madhava of Sangamagrama and Nilakantha Somayaji give broader and clearer shape to many branches of mathematics. Their contributions would spread to Asia, the Middle East, and eventually to Europe. Unlike Vedic mathematics, their works included both astronomical and mathematical contributions. In fact, mathematics of that period was included in the 'astral science' (jyotiḥśāstra) and consisted of three sub-disciplines: mathematical sciences (gaṇita or tantra), horoscope astrology (horā or jātaka) and divination (saṃhitā). This tripartite division is seen in Varāhamihira's 6th century compilation—Pancasiddhantika (literally panca, "five," siddhānta, "conclusion of deliberation", dated 575 CE)—of five earlier works, Surya Siddhanta, Romaka Siddhanta, Paulisa Siddhanta, Vasishtha Siddhanta and Paitamaha Siddhanta, which were adaptations of still earlier works of Mesopotamian, Greek, Egyptian, Roman and Indian astronomy. As explained earlier, the main texts were composed in Sanskrit verse, and were followed by prose commentaries. Later Indian mathematicians such as Aryabhata made references to this text, while later Arabic and Latin translations were very influential in Europe and the Middle East. This Chhedi calendar (594) contains an early use of the modern place-value Hindu-Arabic numeral system now used universally. The value of π, correct to 4 decimal places. Defined the sine (jya) as the modern relationship between half an angle and half a chord. Defined the inverse sine (otkram jya). Gave methods of calculating their approximate numerical values. Contains the earliest tables of sine, cosine and versine values, in 3.75° intervals from 0° to 90°, to 4 decimal places of accuracy. Contains the trigonometric formula sin(n + 1)x − sin nx = sin nx − sin(n − 1)x − (1/225)sin nx. Solutions of simultaneous quadratic equations. Whole number solutions of linear equations by a method equivalent to the modern method. General solution of the indeterminate linear equation . The formula for the sum of the cubes, which was an important step in the development of integral calculus. Brahmagupta's theorem states that AF = FD. Brahmagupta's theorem: If a cyclic quadrilateral has diagonals that are perpendicular to each other, then the perpendicular line drawn from the point of intersection of the diagonals to any side of the quadrilateral always bisects the opposite side. Chapter 12 also included a formula for the area of a cyclic quadrilateral (a generalisation of Heron's formula), as well as a complete description of rational triangles (i.e. triangles with rational sides and rational areas). To the absolute number multiplied by four times the [coefficient of the] square, add the square of the [coefficient of the] middle term; the square root of the same, less the [coefficient of the] middle term, being divided by twice the [coefficient of the] square is the value. also has an integer solution. A rational approximation of the sine function. A formula for calculating the sine of an acute angle without the use of a table, correct to two decimal places. Deals with the concept of ardhaccheda, the number of times a number could be halved, and lists various rules involving this operation. This coincides with the binary logarithm when applied to powers of two, but differs on other numbers, more closely resembling the 2-adic order. The same concept for base 3 (trakacheda) and base 4 (caturthacheda). The derivation of the volume of a frustum by a sort of infinite procedure. It is thought that much of the mathematical material in the Dhavala can attributed to previous writers, especially Kundakunda, Shamakunda, Tumbulura, Samantabhadra and Bappadeva and date who wrote between 200 and 600 CE. Formulae derived to calculate the area of an ellipse and quadrilateral inside a circle. Gave the sum of a series whose terms are squares of an arithmetical progression, and gave empirical rules for area and perimeter of an ellipse. Solved some quintic equations and higher-order polynomials. Solved indeterminate higher order equations. A good rule for finding the volume of a sphere. The formula for solving quadratic equations. Extracting square and cube roots. Eight rules given for operations involving zero. Methods of summation of different arithmetic and geometric series, which were to become standard references in later works. He understood the concept of differentiation after solving the differential equation that resulted from substituting this expression into Aryabhata's differential equation. Solutions of indeterminate equations (kuttaka). General solution of the simultaneous indeterminate linear equation. Nemichandra Siddhanta Chakravati (c. 1100) authored a mathematical treatise titled Gome-mat Saar. Gave a proof for division by zero being infinity. The recognition of a positive number having two square roots. Operations with products of several unknowns. Equations with more than one unknown. Quadratic equations with more than one unknown. The general form of Pell's equation using the chakravala method. The general indeterminate quadratic equation using the chakravala method. Gave a proof of the Pythagorean theorem. Stated Rolle's theorem, a special case of the mean value theorem (one of the most important theorems of calculus and analysis). Derived the differential of the sine function. Computed π, correct to five decimal places. Calculated the length of the Earth's revolution around the Sun to 9 decimal places. The Kerala school of astronomy and mathematics was founded by Madhava of Sangamagrama in Kerala, South India and included among its members: Parameshvara, Neelakanta Somayaji, Jyeshtadeva, Achyuta Pisharati, Melpathur Narayana Bhattathiri and Achyuta Panikkar. It flourished between the 14th and 16th centuries and the original discoveries of the school seems to have ended with Narayana Bhattathiri (1559–1632). In attempting to solve astronomical problems, the Kerala school astronomers independently created a number of important mathematics concepts. The most important results, series expansion for trigonometric functions, were given in Sanskrit verse in a book by Neelakanta called Tantrasangraha and a commentary on this work called Tantrasangraha-vakhya of unknown authorship. The theorems were stated without proof, but proofs for the series for sine, cosine, and inverse tangent were provided a century later in the work Yuktibhāṣā (c.1500–c.1610), written in Malayalam, by Jyesthadeva, and also in a commentary on Tantrasangraha. This formula was already known, for example, in the work of the 10th-century Arab mathematician Alhazen (the Latinised form of the name Ibn Al-Haytham (965–1039)). for large n. This result was also known to Alhazen. Intuitive use of mathematical induction, however, the inductive hypothesis was not formulated or employed in proofs. Using the improved series to derive a rational expression, 104348/33215 for π correct up to nine decimal places, i.e. 3.141592653. Use of an intuitive notion of limit to compute these results. A semi-rigorous (see remark on limits above) method of differentiation of some trigonometric functions. However, they did not formulate the notion of a function, or have knowledge of the exponential or logarithmic functions. The works of the Kerala school were first written up for the Western world by Englishman C.M. Whish in 1835. According to Whish, the Kerala mathematicians had "laid the foundation for a complete system of fluxions" and these works abounded "with fluxional forms and series to be found in no work of foreign countries." However, Whish's results were almost completely neglected, until over a century later, when the discoveries of the Kerala school were investigated again by C. Rajagopal and his associates. Their work includes commentaries on the proofs of the arctan series in Yuktibhāṣā given in two papers, a commentary on the Yuktibhāṣā's proof of the sine and cosine series and two papers that provide the Sanskrit verses of the Tantrasangrahavakhya for the series for arctan, sin, and cosine (with English translation and commentary). The Kerala mathematicians included Narayana Pandit[dubious – discuss] (c. 1340–1400), who composed two works, an arithmetical treatise, Ganita Kaumudi, and an algebraic treatise, Bijganita Vatamsa. Narayana is also thought to be the author of an elaborate commentary of Bhaskara II's Lilavati, titled Karmapradipika (or Karma-Paddhati). Madhava of Sangamagrama (c. 1340–1425) was the founder of the Kerala School. Although it is possible that he wrote Karana Paddhati a work written sometime between 1375 and 1475, all we really know of his work comes from works of later scholars. Parameshvara (c. 1370–1460) wrote commentaries on the works of Bhaskara I, Aryabhata and Bhaskara II. His Lilavati Bhasya, a commentary on Bhaskara II's Lilavati, contains one of his important discoveries: a version of the mean value theorem. Nilakantha Somayaji (1444–1544) composed the Tantra Samgraha (which 'spawned' a later anonymous commentary Tantrasangraha-vyakhya and a further commentary by the name Yuktidipaika, written in 1501). He elaborated and extended the contributions of Madhava. For each case, Citrabhanu gave an explanation and justification of his rule as well as an example. Some of his explanations are algebraic, while others are geometric. Jyesthadeva (c. 1500–1575) was another member of the Kerala School. His key work was the Yukti-bhāṣā (written in Malayalam, a regional language of Kerala). Jyesthadeva presented proofs of most mathematical theorems and infinite series earlier discovered by Madhava and other Kerala School mathematicians. [Their work] takes on board some of the objections raised about the classical Eurocentric trajectory. The awareness [of Indian and Arabic mathematics] is all too likely to be tempered with dismissive rejections of their importance compared to Greek mathematics. The contributions from other civilisations – most notably China and India, are perceived either as borrowers from Greek sources or having made only minor contributions to mainstream mathematical development. An openness to more recent research findings, especially in the case of Indian and Chinese mathematics, is sadly missing"
The historian of mathematics, Florian Cajori, suggested that he and others "suspect that Diophantus got his first glimpse of algebraic knowledge from India." However, he also wrote that "it is certain that portions of Hindu mathematics are of Greek origin". More recently, as discussed in the above section, the infinite series of calculus for trigonometric functions (rediscovered by Gregory, Taylor, and Maclaurin in the late 17th century) were described (with proofs and formulas for truncation error) in India, by mathematicians of the Kerala school, remarkably some two centuries earlier. Some scholars have recently suggested that knowledge of these results might have been transmitted to Europe through the trade route from Kerala by traders and Jesuit missionaries. Kerala was in continuous contact with China and Arabia, and, from around 1500, with Europe. The existence of communication routes and a suitable chronology certainly make such a transmission a possibility. However, there is no direct evidence by way of relevant manuscripts that such a transmission actually took place. According to David Bressoud, "there is no evidence that the Indian work of series was known beyond India, or even outside of Kerala, until the nineteenth century." Both Arab and Indian scholars made discoveries before the 17th century that are now considered a part of calculus. However, they did not, as Newton and Leibniz did, "combine many differing ideas under the two unifying themes of the derivative and the integral, show the connection between the two, and turn calculus into the great problem-solving tool we have today." The intellectual careers of both Newton and Leibniz are well-documented and there is no indication of their work not being their own; however, it is not known with certainty whether the immediate predecessors of Newton and Leibniz, "including, in particular, Fermat and Roberval, learned of some of the ideas of the Islamic and Indian mathematicians through sources we are not now aware." This is an active area of current research, especially in the manuscript collections of Spain and Maghreb. This research is being pursued, among other places, at the Centre National de Recherche Scientifique in Paris. ^ Ifrah 2000, p. 346: "The measure of the genius of Indian civilisation, to which we owe our modern (number) system, is all the greater in that it was the only one in all history to have achieved this triumph. Some cultures succeeded, earlier than the Indian, in discovering one or at best two of the characteristics of this intellectual feat. But none of them managed to bring together into a complete and coherent system the necessary and sufficient conditions for a number-system with the same potential as our own." ^ Bourbaki 1998, p. 46: "...our decimal system, which (by the agency of the Arabs) is derived from Hindu mathematics, where its use is attested already from the first centuries of our era. It must be noted moreover that the conception of zero as a number and not as a simple symbol of separation) and its introduction into calculations, also count amongst the original contribution of the Hindus." ^ Bourbaki 1998, p. 49: Modern arithmetic was known during medieval times as "Modus Indorum" or method of the Indians. Leonardo of Pisa wrote that compared to method of the Indians all other methods is a mistake. This method of the Indians is none other than our very simple arithmetic of addition, subtraction, multiplication and division. Rules for these four simple procedures was first written down by Brahmagupta during 7th century AD. "On this point, the Hindus are already conscious of the interpretation that negative numbers must have in certain cases (a debt in a commercial problem, for instance). In the following centuries, as there is a diffusion into the West (by intermediary of the Arabs) of the methods and results of Greek and Hindu mathematics, one becomes more used to the handling of these numbers, and one begins to have other "representation" for them which are geometric or dynamic." ^ a b "algebra" 2007. Britannica Concise Encyclopedia. Encyclopædia Britannica Online. 16 May 2007. Quote: "A full-fledged decimal, positional system certainly existed in India by the 9th century (AD), yet many of its central ideas had been transmitted well before that time to China and the Islamic world. Indian arithmetic, moreover, developed consistent and correct rules for operating with positive and negative numbers and for treating zero like any other number, even in problematic contexts such as division. Several hundred years passed before European mathematicians fully integrated such ideas into the developing discipline of algebra." ^ (Pingree 2003, p. 45) Quote: "Geometry, and its branch trigonometry, was the mathematics Indian astronomers used most frequently. Greek mathematicians used the full chord and never imagined the half chord that we use today. Half chord was first used by Aryabhata which made trigonometry much more simple. In fact, the Indian astronomers in the third or fourth century, using a pre-Ptolemaic Greek table of chords, produced tables of sines and versines, from which it was trivial to derive cosines. This new system of trigonometry, produced in India, was transmitted to the Arabs in the late eighth century and by them, in an expanded form, to the Latin West and the Byzantine East in the twelfth century." ; the introduction of the sine, more easily handled, is due to Hindu mathematicians of the Middle Ages)." ^ Bressoud 2002, p. 12 Quote: "There is no evidence that the Indian work on series was known beyond India, or even outside Kerala, until the nineteenth century. Gold and Pingree assert  that by the time these series were rediscovered in Europe, they had, for all practical purposes, been lost to India. The expansions of the sine, cosine, and arc tangent had been passed down through several generations of disciples, but they remained sterile observations for which no one could find much use." ^ Plofker 2001, p. 293 Quote: "It is not unusual to encounter in discussions of Indian mathematics such assertions as that “the concept of differentiation was understood [in India] from the time of Manjula (... in the 10th century)” [Joseph 1991, 300], or that "we may consider Madhava to have been the founder of mathematical analysis" (Joseph 1991, 293), or that Bhaskara II may claim to be "the precursor of Newton and Leibniz in the discovery of the principle of the differential calculus" (Bag 1979, 294). ... The points of resemblance, particularly between early European calculus and the Keralese work on power series, have even inspired suggestions of a possible transmission of mathematical ideas from the Malabar coast in or after the 15th century to the Latin scholarly world (e.g., in (Bag 1979, 285)). ... It should be borne in mind, however, that such an emphasis on the similarity of Sanskrit (or Malayalam) and Latin mathematics risks diminishing our ability fully to see and comprehend the former. To speak of the Indian "discovery of the principle of the differential calculus" somewhat obscures the fact that Indian techniques for expressing changes in the Sine by means of the Cosine or vice versa, as in the examples we have seen, remained within that specific trigonometric context. The differential "principle" was not generalised to arbitrary functions—in fact, the explicit notion of an arbitrary function, not to mention that of its derivative or an algorithm for taking the derivative, is irrelevant here"
^ Pingree 1992, p. 562 Quote:"One example I can give you relates to the Indian Mādhava's demonstration, in about 1400 A.D., of the infinite power series of trigonometrical functions using geometrical and algebraic arguments. When this was first described in English by Charles Matthew Whish, in the 1830s, it was heralded as the Indians' discovery of the calculus. This claim and Mādhava's achievements were ignored by Western historians, presumably at first because they could not admit that an Indian discovered the calculus, but later because no one read anymore the Transactions of the Royal Asiatic Society, in which Whish's article was published. The matter resurfaced in the 1950s, and now we have the Sanskrit texts properly edited, and we understand the clever way that Mādhava derived the series without the calculus; but many historians still find it impossible to conceive of the problem and its solution in terms of anything other than the calculus and proclaim that the calculus is what Mādhava found. In this case the elegance and brilliance of Mādhava's mathematics are being distorted as they are buried under the current mathematical solution to a problem to which he discovered an alternate and powerful solution." ^ Katz 1995, pp. 173–174 Quote:"How close did Islamic and Indian scholars come to inventing the calculus? Islamic scholars nearly developed a general formula for finding integrals of polynomials by A.D. 1000—and evidently could find such a formula for any polynomial in which they were interested. But, it appears, they were not interested in any polynomial of degree higher than four, at least in any of the material that has come down to us. Indian scholars, on the other hand, were by 1600 able to use ibn al-Haytham's sum formula for arbitrary integral powers in calculating power series for the functions in which they were interested. By the same time, they also knew how to calculate the differentials of these functions. So some of the basic ideas of calculus were known in Egypt and India many centuries before Newton. It does not appear, however, that either Islamic or Indian mathematicians saw the necessity of connecting some of the disparate ideas that we include under the name calculus. They were apparently only interested in specific cases in which these ideas were needed. ... There is no danger, therefore, that we will have to rewrite the history texts to remove the statement that Newton and Leibniz invented calculus. They were certainly the ones who were able to combine many differing ideas under the two unifying themes of the derivative and the integral, show the connection between them, and turn the calculus into the great problem-solving tool we have today." ^ Coppa, A.; et al. (6 April 2006), "Early Neolithic tradition of dentistry: Flint tips were surprisingly effective for drilling tooth enamel in a prehistoric population", Nature, 440 (7085): 755–6, Bibcode:2006Natur.440..755C, doi:10.1038/440755a, PMID 16598247. ^ A. Seidenberg, 1978. The origin of mathematics. Archive for History of Exact Sciences, vol 18. ^ Pythagorean triples are triples of integers (a, b, c) with the property: a2+b2 = c2. Thus, 32+42 = 52, 82+152 = 172, 122+352 = 372, etc. ^ (Cooke 2005, p. 198): "The arithmetic content of the Śulva Sūtras consists of rules for finding Pythagorean triples such as (3, 4, 5), (5, 12, 13), (8, 15, 17), and (12, 35, 37). It is not certain what practical use these arithmetic rules had. The best conjecture is that they were part of religious ritual. A Hindu home was required to have three fires burning at three different altars. The three altars were to be of different shapes, but all three were to have the same area. These conditions led to certain "Diophantine" problems, a particular case of which is the generation of Pythagorean triples, so as to make one square integer equal to the sum of two others." ^ (Cooke 2005, pp. 199–200): "The requirement of three altars of equal areas but different shapes would explain the interest in transformation of areas. Among other transformation of area problems the Hindus considered in particular the problem of squaring the circle. 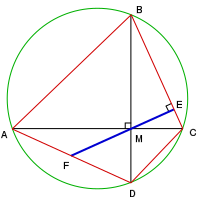 The Bodhayana Sutra states the converse problem of constructing a circle equal to a given square. The following approximate construction is given as the solution.... this result is only approximate. The authors, however, made no distinction between the two results. In terms that we can appreciate, this construction gives a value for π of 18 (3 − 2√2), which is about 3.088." ^ The value of this approximation, 577/408, is the seventh in a sequence of increasingly accurate approximations 3/2, 7/5, 17/12, ... to √2, the numerators and denominators of which were known as "side and diameter numbers" to the ancient Greeks, and in modern mathematics are called the Pell numbers. If x/y is one term in this sequence of approximations, the next is (x + 2y)/(x + y). These approximations may also be derived by truncating the continued fraction representation of √2. ^ Neugebauer, O. and A. Sachs. 1945. Mathematical Cuneiform Texts, New Haven, CT, Yale University Press. p. 45. ^ Mathematics Department, University of British Columbia, The Babylonian tabled Plimpton 322.
form a primitive Pythagorean triple if c2 = a2+b2 and if the highest common factor of a, b, c is 1. In the particular Plimpton322 example, this means that 135002+127092 = 185412 and that the three numbers do not have any common factors. However some scholars have disputed the Pythagorean interpretation of this tablet; see Plimpton 322 for details. ^ Ingerman, Peter Zilahy (1 March 1967). ""Pānini-Backus Form" suggested". Communications of the ACM. 10 (3): 137. doi:10.1145/363162.363165. ISSN 0001-0782. ^ "Panini-Backus". www.infinityfoundation.com. Retrieved 16 March 2018. ^ (Hayashi 2005, p. 371) Quote:"The dates so far proposed for the Bakhshali work vary from the third to the twelfth centuries CE, but a recently made comparative study has shown many similarities, particularly in the style of exposition and terminology, between Bakhshalī work and Bhāskara I's commentary on the Āryabhatīya. This seems to indicate that both works belong to nearly the same period, although this does not deny the possibility that some of the rules and examples in the Bakhshālī work date from anterior periods." ^ a b Anton, Howard and Chris Rorres. 2005. Elementary Linear Algebra with Applications. 9th edition. New York: John Wiley and Sons. 864 pages. ISBN 0-471-66959-8. ^ Devlin, Hannah (2017-09-13). "Much ado about nothing: ancient Indian text contains earliest zero symbol". The Guardian. ISSN 0261-3077. Retrieved 2017-09-14. ^ Mason, Robyn (2017-09-14). "Oxford Radiocarbon Accelerator Unit dates the world's oldest recorded origin of the zero symbol". School of Archaeology, University of Oxford. Retrieved 2017-09-14. ^ "Carbon dating finds Bakhshali manuscript contains oldest recorded origins of the symbol 'zero'". Bodleian Library. 2017-09-14. Retrieved 2017-09-14. ^ Cooke, Roger (1997), "The Mathematics of the Hindus", The History of Mathematics: A Brief Course, Wiley-Interscience, p. 197, ISBN 978-0-471-18082-1, The word Siddhanta means that which is proved or established. The Sulva Sutras are of Hindu origin, but the Siddhantas contain so many words of foreign origin that they undoubtedly have roots in Mesopotamia and Greece. ^ Katz, Victor J. (1995), "Ideas of Calculus in Islam and India", Mathematics Magazine, 68 (3): 163–174, doi:10.2307/2691411, JSTOR 2691411. ^ a b Joseph (2000), p. 298–300. ^ Singh, A. N. Singh (1936), "On the Use of Series in Hindu Mathematics", Osiris, 1: 606–628, doi:10.1086/368443. ^ Edwards, C. H., Jr. 1979. The Historical Development of the Calculus. New York: Springer-Verlag. ^ Rajagopal, C.; Rangachari, M. S. (1949), "A Neglected Chapter of Hindu Mathematics", Scripta Mathematica, 15: 201–209. ^ Rajagopal, C.; Rangachari, M. S. (1951), "On the Hindu proof of Gregory's series", Ibid., 17: 65–74. ^ Rajagopal, C.; Venkataraman, A. (1949), "The sine and cosine power series in Hindu mathematics", Journal of the Royal Asiatic Society of Bengal (Science), 15: 1–13. ^ Rajagopal, C.; Rangachari, M. S. (1977), "On an untapped source of medieval Keralese mathematics", Archive for History of Exact Sciences, 18: 89–102, doi:10.1007/BF00348142 (inactive 2019-03-13). ^ Rajagopal, C.; Rangachari, M. S. (1986), "On Medieval Kerala Mathematics", Archive for History of Exact Sciences, 35 (2): 91–99, doi:10.1007/BF00357622. ^ Joseph, G. G. 1997. "Foundations of Eurocentrism in Mathematics." In Ethnomathematics: Challenging Eurocentrism in Mathematics Education (Eds. Powell, A. B. et al.). SUNY Press. ISBN 0-7914-3352-8. p.67-68. ^ a b Almeida, D. F.; John, J. K.; Zadorozhnyy, A. (2001), "Keralese Mathematics: Its Possible Transmission to Europe and the Consequential Educational Implications", Journal of Natural Geometry, 20: 77–104. ^ Gold, D.; Pingree, D. (1991), "A hitherto unknown Sanskrit work concerning Madhava's derivation of the power series for sine and cosine", Historia Scientiarum, 42: 49–65. Bourbaki, Nicolas (1998), Elements of the History of Mathematics, Berlin, Heidelberg, and New York: Springer-Verlag, 301 pages, ISBN 978-3-540-64767-6 . Boyer, C. B.; Merzback (fwd. by Isaac Asimov), U. C. (1991), History of Mathematics, New York: John Wiley and Sons, 736 pages, ISBN 978-0-471-54397-8 . Bressoud, David (2002), "Was Calculus Invented in India? ", The College Mathematics Journal (Math. Assoc. Amer. ), 33 (1): 2–13, doi:10.2307/1558972, JSTOR 1558972 . Bronkhorst, Johannes (2001), "Panini and Euclid: Reflections on Indian Geometry", Journal of Indian Philosophy, Springer Netherlands, 29 (1–2): 43–80, doi:10.1023/A:1017506118885 . Burton, David M. (1997), The History of Mathematics: An Introduction, The McGraw-Hill Companies, Inc., pp. 193–220 . Cooke, Roger (2005), The History of Mathematics: A Brief Course, New York: Wiley-Interscience, 632 pages, ISBN 978-0-471-44459-6 . Dani, S. G. (25 July 2003), "On the Pythagorean triples in the Śulvasūtras" (PDF), Current Science, 85 (2): 219–224 . Datta, Bibhutibhusan (December 1931), "Early Literary Evidence of the Use of the Zero in India", The American Mathematical Monthly, 38 (10): 566–572, doi:10.2307/2301384, JSTOR 2301384 . Datta, Bibhutibhusan; Singh, Avadesh Narayan (1962), History of Hindu Mathematics : A source book, Bombay: Asia Publishing House . De Young, Gregg (1995), "Euclidean Geometry in the Mathematical Tradition of Islamic India", Historia Mathematica, 22 (2): 138–153, doi:10.1006/hmat.1995.1014 . Encyclopædia Britannica (Kim Plofker) (2007), "mathematics, South Asian", Encyclopædia Britannica Online: 1–12, retrieved 18 May 2007 . Filliozat, Pierre-Sylvain (2004), "Ancient Sanskrit Mathematics: An Oral Tradition and a Written Literature", in Chemla, Karine; Cohen, Robert S.; Renn, Jürgen; et al., History of Science, History of Text (Boston Series in the Philosophy of Science), Dordrecht: Springer Netherlands, 254 pages, pp. 137–157, pp. 360–375, ISBN 978-1-4020-2320-0 . Fowler, David (1996), "Binomial Coefficient Function", The American Mathematical Monthly, 103 (1): 1–17, doi:10.2307/2975209, JSTOR 2975209 . Hayashi, Takao (1995), The Bakhshali Manuscript, An ancient Indian mathematical treatise, Groningen: Egbert Forsten, 596 pages, ISBN 978-90-6980-087-5 . Hayashi, Takao (1997), "Aryabhata's Rule and Table of Sine-Differences", Historia Mathematica, 24 (4): 396–406, doi:10.1006/hmat.1997.2160 . Hayashi, Takao (2003), "Indian Mathematics", in Grattan-Guinness, Ivor, Companion Encyclopedia of the History and Philosophy of the Mathematical Sciences, 1, pp. 118–130, Baltimore, MD: The Johns Hopkins University Press, 976 pages, ISBN 978-0-8018-7396-6 . Hayashi, Takao (2005), "Indian Mathematics", in Flood, Gavin, The Blackwell Companion to Hinduism, Oxford: Basil Blackwell, 616 pages, pp. 360–375, pp. 360–375, ISBN 978-1-4051-3251-0 . Henderson, David W. (2000), "Square roots in the Sulba Sutras", in Gorini, Catherine A., Geometry at Work: Papers in Applied Geometry, 53, pp. 39–45, Washington DC: Mathematical Association of America Notes, 236 pages, pp. 39–45, ISBN 978-0-88385-164-7 . Joseph, G. G. (2000), The Crest of the Peacock: The Non-European Roots of Mathematics, Princeton, NJ: Princeton University Press, 416 pages, ISBN 978-0-691-00659-8 . Katz, Victor J. (1995), "Ideas of Calculus in Islam and India", Mathematics Magazine (Math. Assoc. Amer. ), 68 (3): 163–174, doi:10.2307/2691411, JSTOR 2691411 . Katz, Victor J., ed. (2007), The Mathematics of Egypt, Mesopotamia, China, India, and Islam: A Sourcebook, Princeton, NJ: Princeton University Press, 685 pages, pp 385–514, ISBN 978-0-691-11485-9 . Keller, Agathe (2005), "Making diagrams speak, in Bhāskara I's commentary on the Aryabhaṭīya", Historia Mathematica, 32 (3): 275–302, doi:10.1016/j.hm.2004.09.001 . Kichenassamy, Satynad (2006), "Baudhāyana's rule for the quadrature of the circle", Historia Mathematica, 33 (2): 149–183, doi:10.1016/j.hm.2005.05.001 . Pingree, David (1971), "On the Greek Origin of the Indian Planetary Model Employing a Double Epicycle", Journal of Historical Astronomy, 2 (1): 80–85, doi:10.1177/002182867100200202 . Pingree, David (1973), "The Mesopotamian Origin of Early Indian Mathematical Astronomy", Journal of Historical Astronomy, 4 (1): 1–12, doi:10.1177/002182867300400102 . Pingree, David; Staal, Frits (1988), "Reviewed Work(s): The Fidelity of Oral Tradition and the Origins of Science by Frits Staal", Journal of the American Oriental Society, 108 (4): 637–638, doi:10.2307/603154, JSTOR 603154 . Pingree, David (2003), "The logic of non-Western science: mathematical discoveries in medieval India", Daedalus, 132 (4): 45–54, doi:10.1162/001152603771338779 . Plofker, Kim (1996), "An Example of the Secant Method of Iterative Approximation in a Fifteenth-Century Sanskrit Text", Historia Mathematica, 23 (3): 246–256, doi:10.1006/hmat.1996.0026 . Plofker, Kim (2001), "The "Error" in the Indian "Taylor Series Approximation" to the Sine", Historia Mathematica, 28 (4): 283–295, doi:10.1006/hmat.2001.2331 . Plofker, K. (2007), "Mathematics of India", in Katz, Victor J., The Mathematics of Egypt, Mesopotamia, China, India, and Islam: A Sourcebook, Princeton, NJ: Princeton University Press, 685 pages, pp 385–514, pp. 385–514, ISBN 978-0-691-11485-9 . Plofker, Kim (2009), Mathematics in India: 500 BCE–1800 CE, Princeton, NJ: Princeton University Press. Pp. 384., ISBN 978-0-691-12067-6 . Price, John F. (2000), "Applied geometry of the Sulba Sutras" (PDF), in Gorini, Catherine A., Geometry at Work: Papers in Applied Geometry, 53, pp. 46–58, Washington DC: Mathematical Association of America Notes, 236 pages, pp. 46–58, ISBN 978-0-88385-164-7 .
by Leibniz, Gregory, and Nilakantha", Mathematics Magazine (Math. Assoc. Amer. ), 63 (5): 291–306, doi:10.2307/2690896, JSTOR 2690896 . Staal, Frits (1986), The Fidelity of Oral Tradition and the Origins of Science, Mededelingen der Koninklijke Nederlandse Akademie von Wetenschappen, Afd. Letterkunde, NS 49, 8. Amsterdam: North Holland Publishing Company, 40 pages . Staal, Frits (1995), "The Sanskrit of science", Journal of Indian Philosophy, Springer Netherlands, 23 (1): 73–127, doi:10.1007/BF01062067 . Staal, Frits (1999), "Greek and Vedic Geometry", Journal of Indian Philosophy, 27 (1–2): 105–127, doi:10.1023/A:1004364417713 . Staal, Frits (2001), "Squares and oblongs in the Veda", Journal of Indian Philosophy, Springer Netherlands, 29 (1–2): 256–272, doi:10.1023/A:1017527129520 . Staal, Frits (2006), "Artificial Languages Across Sciences and Civilisations", Journal of Indian Philosophy, Springer Netherlands, 34 (1): 89–141, doi:10.1007/s10781-005-8189-0 . Stillwell, John (2004), Mathematics and its History, Undergraduate Texts in Mathematics (2 ed. ), Springer, Berlin and New York, 568 pages, doi:10.1007/978-1-4684-9281-1, ISBN 978-0-387-95336-6 . Thibaut, George (1984) , Mathematics in the Making in Ancient India: reprints of 'On the Sulvasutras' and 'Baudhyayana Sulva-sutra', Calcutta and Delhi: K. P. Bagchi and Company (orig. Journal of Asiatic Society of Bengal), 133 pages . Keller, Agathe (2006), Expounding the Mathematical Seed. Vol. 1: The Translation: A Translation of Bhaskara I on the Mathematical Chapter of the Aryabhatiya, Basel, Boston, and Berlin: Birkhäuser Verlag, 172 pages, ISBN 978-3-7643-7291-0 . Keller, Agathe (2006), Expounding the Mathematical Seed. Vol. 2: The Supplements: A Translation of Bhaskara I on the Mathematical Chapter of the Aryabhatiya, Basel, Boston, and Berlin: Birkhäuser Verlag, 206 pages, ISBN 978-3-7643-7292-7 . Neugebauer, Otto; Pingree (eds. ), David (1970), The Pañcasiddhāntikā of Varāhamihira, New edition with translation and commentary, (2 Vols. ), Copenhagen CS1 maint: Extra text: authors list (link). Pingree, David (ed) (1978), The Yavanajātaka of Sphujidhvaja, edited, translated and commented by D. Pingree, Cambridge, MA: Harvard Oriental Series 48 (2 vols.) CS1 maint: Extra text: authors list (link). Sarma, K. V. (ed) (1976), Āryabhaṭīya of Āryabhaṭa with the commentary of Sūryadeva Yajvan, critically edited with Introduction and Appendices, New Delhi: Indian National Science Academy CS1 maint: Extra text: authors list (link). Sen, S. N.; Bag (eds. ), A. K. (1983), The Śulbasūtras of Baudhāyana, Āpastamba, Kātyāyana and Mānava, with Text, English Translation and Commentary, New Delhi: Indian National Science Academy CS1 maint: Extra text: authors list (link). Shukla, K. S. (ed) (1976), Āryabhaṭīya of Āryabhaṭa with the commentary of Bhāskara I and Someśvara, critically edited with Introduction, English Translation, Notes, Comments and Indexes, New Delhi: Indian National Science Academy CS1 maint: Extra text: authors list (link). Shukla, K. S. (ed) (1988), Āryabhaṭīya of Āryabhaṭa, critically edited with Introduction, English Translation, Notes, Comments and Indexes, in collaboration with K.V. Sarma, New Delhi: Indian National Science Academy CS1 maint: Extra text: authors list (link). An overview of Indian mathematics, MacTutor History of Mathematics Archive, St Andrews University, 2000. Index of Ancient Indian mathematics, MacTutor History of Mathematics Archive, St Andrews University, 2004. Indian Mathematics: Redressing the balance, Student Projects in the History of Mathematics. Ian Pearce. MacTutor History of Mathematics Archive, St Andrews University, 2002. InSIGHT 2009, a workshop on traditional Indian sciences for school children conducted by the Computer Science department of Anna University, Chennai, India.